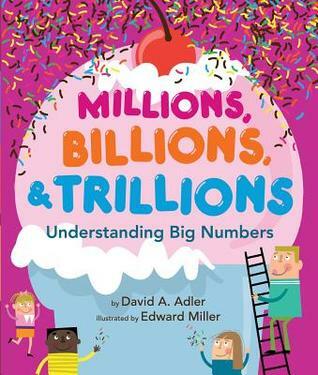 Millions, Billions, & Trillions: Understanding Big Numbers by David A. Adler, illustrated by Edward Miller. Grades 2-4. Holiday House, January 2013. Unpaged. Review copy provided by my local library. We tend to throw around large numbers like millions and billions and trillions and we hear about them in the news quite often. But such big numbers can be really hard to conceptualize. What do they really mean? If you had a million dollars, how much is that really? In Millions, Billions, & Trillions, David A. Adler puts his inimitable skills to work in supplying kids with concrete examples to help them figure out just what such big numbers really mean. Want to see a million? Get a quarter cup of sugar and dump it out onto a dark-colored sheet of construction paper. You have about a million grains of sugar there. Adler gives a couple of concrete examples of each number (explaining at each step how he's coming up with his figures and estimates) and then some examples of how kids are likely to hear these numbers used. Populations of large cities are often in the millions. The earth's population is in the billions. And when people on the news talk about the country's debts and budgets, the numbers are often in the trillions. Adler includes an author's note that talks about even larger numbers and he notes that the names for large numbers differ in different countries. The computer generated cartoony illustrations pop with color, adding kid appeal to this kid-friendly math book. They feature a diverse cast of characters and such fun images as giant ice cream sundaes and stacks of pizzas we might order with our million dollars. Add this book to your repertoire for STEM programming! Pair it with David Schwartz's How Much is a Million? for a discussion about large numbers and challenge the kids to come up with some estimates of their own. This would be a fun way to get to the M (math) in STEM. Millions, Billions, & Trillions is on shelves now! Happy Nonfiction Monday! Lisa has this week's roundup at Shelf-employed.